These types can be used independently or in combination with each other, depending on the desired design. Alcove Broken Flagstone has natural cleft tops and irregular shapes. Sizes range from 2 to 6 square feet each, and is sorted to two thicknesses; ¾” to 1 ¼” and 1 ½” to 2 ½”. This product is shipped upright on pallets weighing between 3000 and 3600 pounds each. 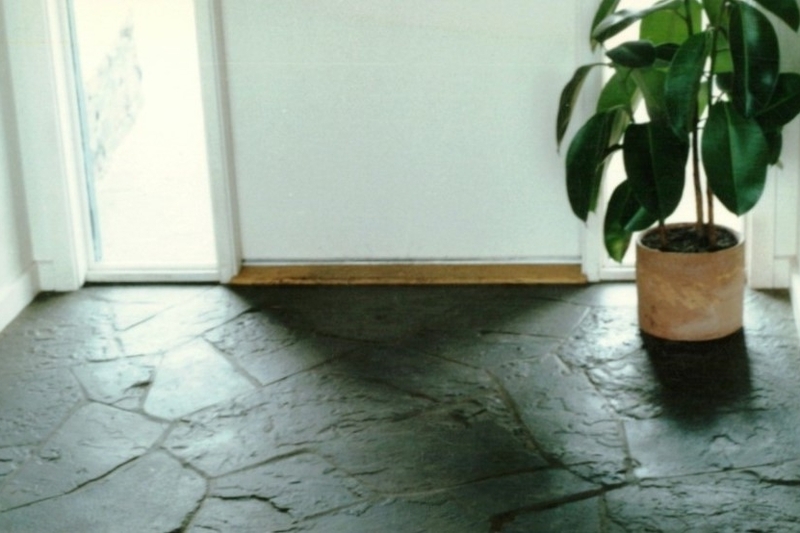 Alcove Paving Slabs have natural cleft tops, and irregular shapes. Sizes range from 6 to 15 square feet each; and they are sorted to two thicknesses; 1 ½” to 3” and 3” to 4 ½”. Alcove Rip-Rap has natural, rustic tops and irregular shapes. Sizes range from 2 to 12 square feet each; and the range of thickness is 2” to 5”. This is a nice product for pond-scaping or creating hardscaping for waterfalls or areas where drainage rock is needed. 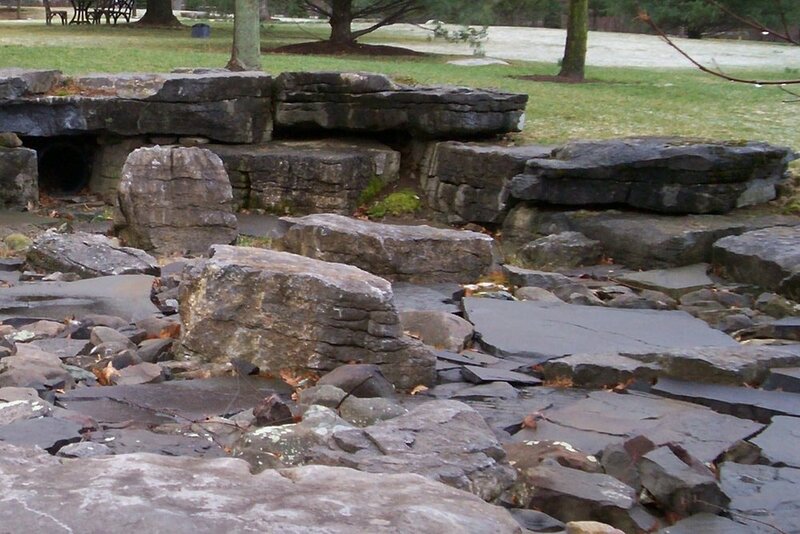 Onondaga (Limerock) Rustic Paving is a by-product of our cutting operation. These have rough tops but are suitable for garden pathways or drainage areas. There are approximately 1 to 3 square feet in size and 1” to 3” thick. Generally, they have 1 or 2 sawn sides. Alcove Broken Pavers have natural cleft tops and irregular shapes. Sizes range from 1 to 2 square feet each and is sorted to two thicknesses; ¾” to 1 ½” and 1 ½” to 2 1/2”. This product is stacked flat and shipped on pallets weighing 3000 pounds. Alcove Natural Paving Bars are small pieces that are natural faces on all sides. They can be used as a paving or veneer. They are approximately 2” thick x 2” wide x 6” to 10” long. Our typical 4” veneer can also be used in this flat method if larger pieces are desired. Alcove Thermal Broken Paving is a by-product of our cutting operation. These pieces have thermaled tops and generally have 1 or 2 sawn edges. Cracks are sometimes present. Pieces range from 1 to 6 square feet in size, and are generally 1” to 3” thick. Jobsite cutting would be necessary to select and fit pieces together. Onondaga (Limerock) End Slabs are by products of our slabbing operation. When a large block is being slabbed the “end” pieces are sawn at various thicknesses (usually 3” to 5”) to keep the rustic, natural face. Sizes are generally 36” x 36” to 60” x 96”. Pieces are semi-square (the shape of the original block) or irregular if they had been broken while unloading the slabbing saws; due to the presence of natural cracks.